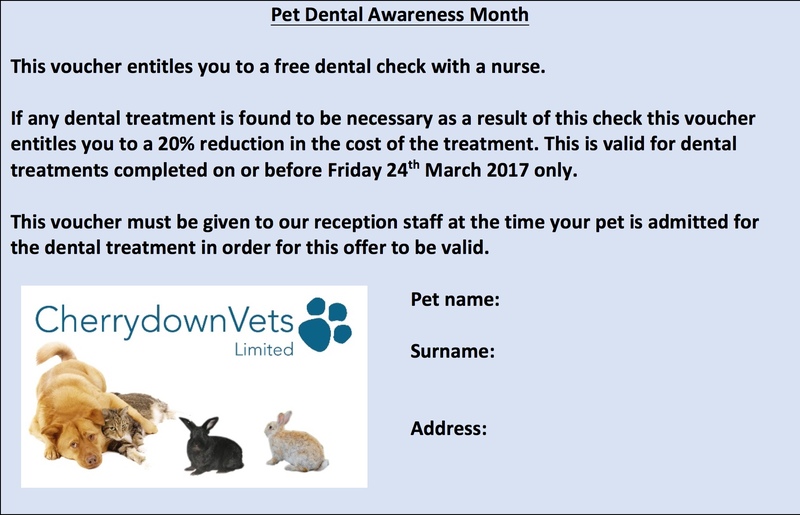 As part of our commitment to the health and wellbeing of our clients, we are supporting Pet Dental Awareness Month. Our experts have written some handy tips and advice to help you keep your pet’s oral hygiene in tip top condition. How will I know if my pet has bad teeth? When dental disease is suspected your pet should be examined by a vet. Diet Your pet’s diet can be very important in preventing tartar build-up on teeth. Try to feed your pet good quality dry foods rather than soft foods, as the latter tend to stick to the teeth, allowing the rapid build-up of tartar. Some diets are especially formulated to help keep teeth in the best possible condition. If you are considering changing your pet’s diet, please speak to our vets and nurses for advice. Dental chews can be extremely helpful, especially for dogs. Please take care that they are not too rich or too big for your pet. Start early Some pets can be a little shy of their mouth being opened. A gentle mouth examination should be part of your general puppy training (along with looking in the ears and looking at the feet – all sensitive areas) to get your pet used to this type of handling. Our nursing team will show you how to do this when you attend routine puppy checks or one of our puppy parties. (If applicable). Previous PostPrevious What Is Catnip?